Until recently, the study of organic molecules has traveled down two disparate intellectual paths—the experimental, or physical, method and the computational, or theoretical, method. Working somewhat independently of each other, these disciplines have guided research for decades, but they are now being combined efficiently into one unified strategy. Norman L Allinger received his BS from the University of California, Berkeley, in 1951 and his PhD from the University of California, Los Angeles, in 1954. He was on the faculty at Wayne State University before coming to the University of Georgia as Research Professor in 1969. He is known for his use of computational chemistry, especially molecular mechanics, to solve a variety of chemical problems. 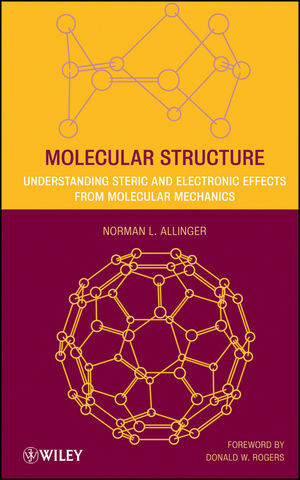 He is the senior author of the MM2, MM3, and MM4 molecular mechanics software packages. Other Very Short H···H Distances. C–H Bond Length versus Vibrational Frequency. Comparison of X-Ray Crystal Structure with Calculated Structures.